Hot Ham and Cheese Crescents recipe - ham, cheddar, swiss, cream cheese, dijon mustard, Worcestershire, brown sugar mixed together and baked in crescent rolls and topped with poppy seeds. I am totally addicted to these! I could not stop eating them! I am already planning on making them again this week! Last weekend was a big food week for us. We had tailgate food on Thursday night while we watched college football. Since our team didn't play on Saturday, we took a weekend trip to Nashville. We ate at some of our favorite places and did more tailgating on Sunday. After it was all said and done, we really overdid it on food. We aren't used to eating that much food, so our tummies were a little upset. Thankfully, I had some Pepto-Bismol chewable tablets in my pocket to give us some much-needed relief. I always make sure to bring along some Pepto-Bismol for our tailgates just in case we overindulge. I love the chewable tablets because they fit perfectly in my pocket! 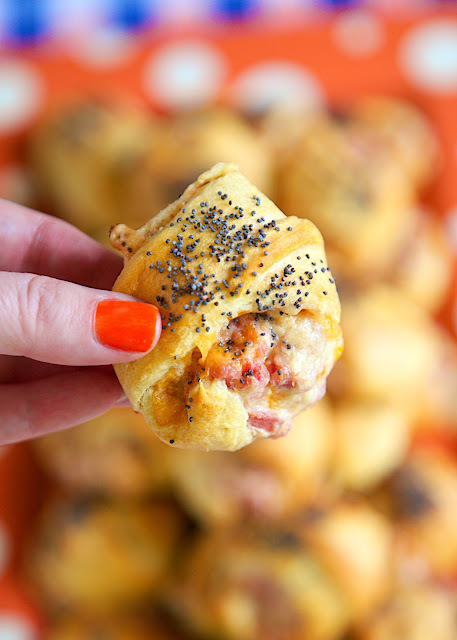 Some of our overindulgences came from these Hot Ham and Cheese Crescents. I am totally addicted to them! 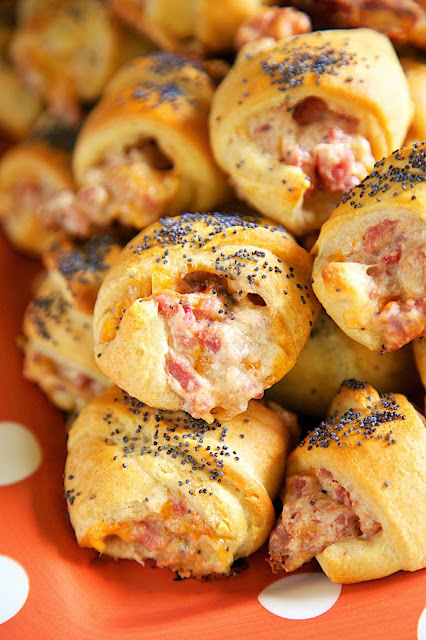 They are a combination of my Party Ham Sandwiches and Sausage and Cream Cheese Crescents. They are SOOOOO good! I could not stop eating these things! 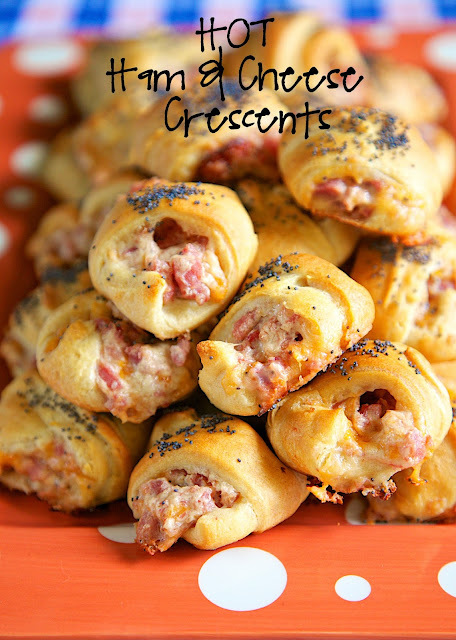 These Hot Ham and Cheese Crescents are great for a party or even lunch and dinner. We served them for a tailgating party and they were gone in a flash! I am already planning on making them again this weekend. SO good! The filling for these Hot Ham and Cheese Crescents can be made ahead of time and refrigerated until you are ready to bake the crescents. I like to cut the crescent rolls into two triangles to make bite-sized crescents. If you are making the crescents for lunch or dinner, you may want to keep the crescents whole. I think the crescents taste best hot or at room temperature. Mix together ham, cheddar, swiss, cream cheese, dijon mustard, Worcestershire, brown sugar and onion powder. Separate crescent rolls into 24 triangles. Cut each triangle in half, forming two triangles. Scoop one tablespoon of ham mixture on the long end of each triangle. Roll up crescents and place on baking sheet. Sprinkle tops of crescents with poppy seeds. They look delicious and would be perfect for football watching. I would totally over indulge on these too! Yay for tailgating food which is like the best food ever! Being English I'm not sure what crescent rolls are ??? Any advice as to what I need to look for in our stores. Jus~Rol Croissants refrigerated tinned pastry should work. Can you help, being English I'm not sure what crescent rolls are, any ideas as to their name in our stores ?? what would a good alternative cheese be? No a swiss fan. Do these reheat well, or are they best served fresh out of the oven? Do these reheat well, if they are made ahead of time? Or are they best served fresh? I prefer them the day they are baked. I've refrigeratored the leftovers and they are good but not as good as the day I made them. If you do reheat them, wrap them in foil and reheat them in the oven. Much better than the microwave oven. Could you use chicken or another meat? Made these today, and I did skip the poppy seeds on top because I didn't have any and didn't feel like a store run. These are very good. I did not have swiss, so I used cheddar and monterrey jack cheese. It was very good. I also used deli ham and diced it and it was very good as well. I served this for a group at home, watching Sunday night football, and it was a hit. So freaking good!!! Just made them!